Shrubs or trees, with short trunk, erect, to 2 m. Stem segments not easily detached, green or, when under stress, lavender to red-purple at least around areoles, flattened, subcircular, sometimes ovate or obovate sometimes wider than long, 10-20 × 9.5-20 cm, thin, nearly smooth, glabrous; areoles 6-8(-9) per diagonal row across midstem segment, obovate or elliptic to subcircular, sometimes reniform, 3-3.5 × 2-2.5 mm; wool tan to brown. 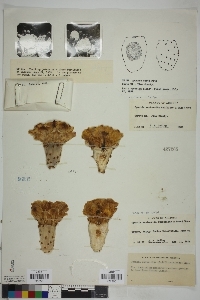 Spines 0-1(-2) per areole, usually few along margins of stem segments, deflexed to erect, pale yellow to horn colored (aging reddish brown), straight to slightly curved, acicular, terete, the longest to 40 mm, usually shorter. Glochids dense in crescent at adaxial edge of areole, nearly encircling areoles, and in subapical tuft, of even height, yellow to tan, aging brown, to 5 mm. Flowers: inner tepals yellow throughout, fading orangish, 25-45 mm; filaments pale yellow throughout or pale yellow proximally, white distally; anthers pale yellow; style white; stigma lobes light green. Fruits purplish, green inside, obovoid to barrel-shaped, 25-45 × 20-30 mm, fleshy, glabrous, spineless; areoles 34-44(-54). Seeds tan, 3.5-5 × 3-4 mm, sides convex, often bearing bumps; girdle protruding 0.5 mm. 2n = 22. Flowering spring (Apr-early Jun). Deserts, grasslands, oak woodlands, flats, slopes, sandy to rocky soils; 700-1600 m; Ariz.; Mexico (Sonora). 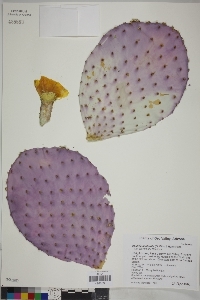 Opuntia santa-rita has been reported for New Mexico and Texas, but I have seen no supporting specimens. 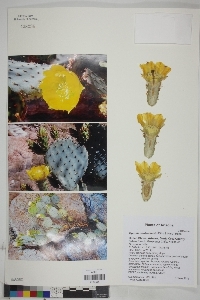 Opuntia santa-rita is commonly confused with spineless O. macrocentra, but has yellow inner tepals with red basal portions. In southern Arizona, O. santa-rita hybridizes with O. chlorotica; that hybrid, with a chromosome number of 2n = 22, apparently accounts for L. D. Benson´s (1982) inclusion in the United States of Mexico´s O. gosseliniana F. A. C. Weber. Plant: Trees, shrubby with short trunks, to 2 m tall. PADS all purple to green with purple areas around areoles and pad margins, glabrous, subcircular, sometimes ovate or obovate, sometimes wider than long, thin, 10-20 cm long, 9.5-20 cm broad. AREOLES 6-8(-9) in diagonal row across mid-pad, obovate or elliptic to subcircular, sometimes reniform, 3-3.5 mm long, 2-2.5 mm wide; wool tan to brown Leaves: SPINES, if present, mostly in distal areoles and commonly marginal in pad, pale yellow to pale yellow-grey, aging red-brown), straight to slightly curved, acicular, deflexed to erect, 0-1(-2) per areole and usually few per pad, the largest ones to 4 cm long, usually shorter. GLOCHIDS yellow to tan, aging brown, dense, of even height, 3(-6) mm long, in an elongated apical crescent that nearly encircles areole plus a subapical tuft Flowers: inner tepals yellow throughout, fading orangish, 2.5-4.5 cm long; filaments cream-colored or pale yellow below, white above; style white; fresh stigmas light green Fruit: FRUITS purplish, green inside, fleshy, obovoid to barrel-shaped, spineless, 2.5-4.5 cm long, 2-3 cm in diameter; areoles 34-44(-54). SEEDS tan, flattened sides convex, often bearing bumps, 3.5-5 mm long, 3-4 mm wide; girdle protruding to 0.5 mm. Misc: Sandy to rocky soils on flats and slopes; deserts, grasslands to oak woodlands; 750-1600 m (2400-5300 ft); Apr-early Jun REFERENCES: Pinkava, Donald J. 2003. Cactaceae. J. Ariz. - Nev. Acad. Sci. Volume 35(2).